トップ > ASP > What is antimicrobial stewardship? The use of the term 'antimicrobial stewardship' has grown exponentially in recent years, typically referring to programmes and interventions that aim to optimize antimicrobial use. Although antimicrobial stewardship originated within human healthcare, it is increasingly applied in broader contexts including animal health and One Health. As the use of the term 'antimicrobial stewardship' becomes more common, it is important to consider what antimicrobial stewardship is, as well as what it is not. 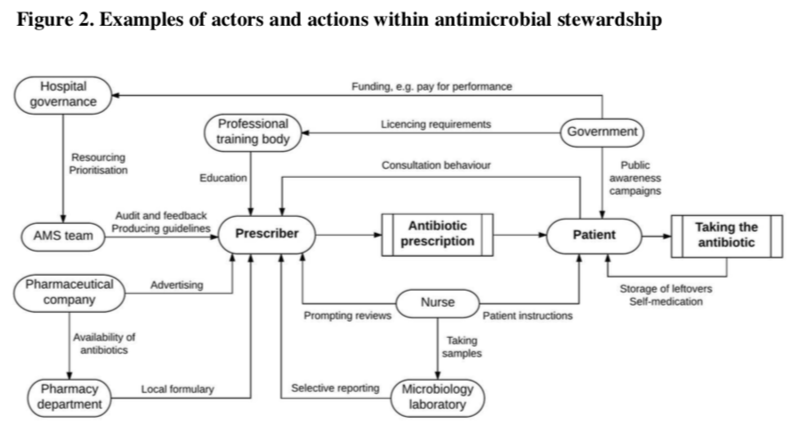 To review the emergence and evolution of the term 'antimicrobial stewardship'. We searched and reviewed existing literature and official documents, which mostly focused on antibiotics. We contacted the authors of the first publications that mentioned antimicrobial stewardship. We describe the historical background behind how antimicrobial stewardship came into use in clinical settings. We discuss challenges emerging from the varied descriptions of antimicrobial stewardship in the literature, including an over-emphasis on individual prescriptions, an under-emphasis on the societal implications of antimicrobial use, and language translation problems. To help address these challenges, we suggest viewing antimicrobial stewardship as a strategy, a coherent set of actions which promote using antimicrobials responsibly. We stress the continuous need for 'responsible use' to be defined and translated into context-specific and time-specific actions. Furthermore, we present examples of actions that can be undertaken within antimicrobial stewardship across human and animal health. AMS refers to coordinated interventions designed to improve and measure the appropriate use of antimicrobial agents by promoting the selection of the optimal antimicrobial drug regimen including dosing, duration of therapy and route of administration. Antimicrobial stewardship is defined as interventions to improve the appropriate use of antimicrobials through promotion of optimal agent selection, dosing, duration, and route of administration. Antimicrobial stewardship refers to a program or series of interventions to monitor and direct antimicrobial use at a healthcare institution, thus providing a standard, evidence-based approach to judicious antimicrobial use.